[Updated] Bermudian Jenaya Wade-Fray will be part of Great Britain’s team for their Olympic game against Canada this afternoon [July 30], which is scheduled to begin at 4pm Bermuda time. Both teams come into the match with a 0-1 record, with Great Britain having lost to Australia and Canada losing to Russia. Wade-Fray was forced to sit out the first game with an injury, however is hoping to take the Court for this match. Update 4.03pm: The match is underway, and Bermudian Jenaya Wade Fray is playing. 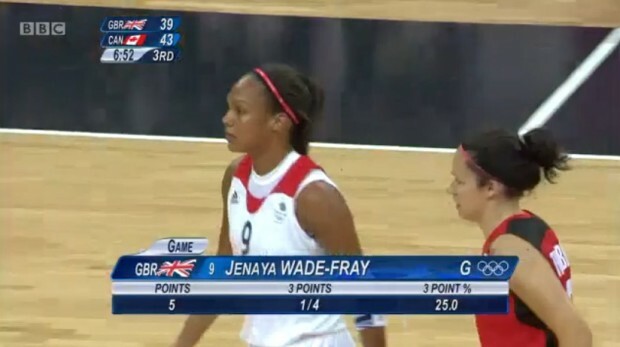 Her appearance in this game today is believed to be the first ever appearance by a Bermudian in Olympic basketball. You can follow along live on the Olympic website here. Update 4.29pm: The game is in the second quarter, with Canada up 23 -22, Wade Fray has missed a couple of three-pointers however had a steal. Update 4.35pm: Wade Fray has been substituted. Update 4.44pm: Wade Fray was brought back on the Court before the end of the second quarter. At the end of the second quarter Canada is up 36 – 32. Update 5.02pm: Game back underway, Wade-Fray has now scored 5 points. A screencap courtesy of the BBC is below. Update 5.23pm: Great Britain has just taken the lead….score is 59 – 57. Update 5.36pm: Canada is now up 68 – 63. Update 5.45pm: Canada won, score 73 – 65. Wade-Fray played 19 minutes, and ended with 5 points and 1 steal. Watched my super Aunt Jenaya live and up close at court side WOW!!!! !